Anecdotal evidence suggests that the cost of living in some of the tourist destinations may have risen a little more sharply than the rate of inflation this year. 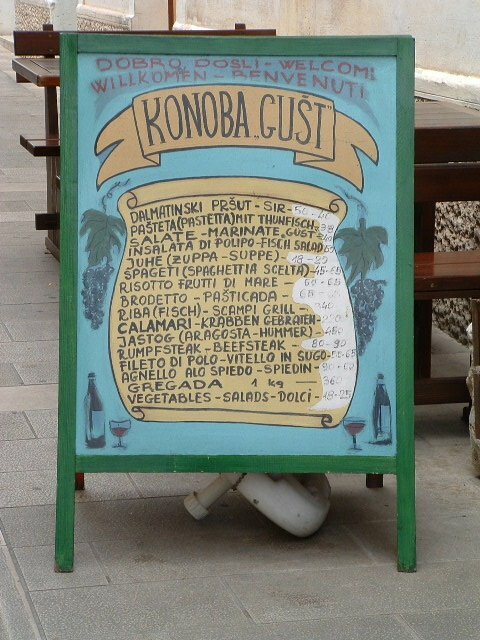 Certainly in our area, around Split and Trogir, we have noticed an extra two kunas (twenty pence) here and there on coffees and beer - an increase of between 20% and 30%. In Croatia’s defence, the prices were probably much lower than other Mediterranean equivalents to start with, but hopefully caution will be exercised until the tourism infrastructure is a little more geared up to measure demand and supply. Sensible entrepreneurs would be wise to take the long term view – locals, on which many establishments depend outside the high season, won’t be impressed by these higher prices, and part of Croatia’s attraction as a tourist destination is that it is good value for money. The other somewhat disturbing news is the increase in car parking charges in some areas and the appearance of car parking fees where before there were none. Obviously the “Mediterranean that once was” has now caught onto another money spinner, or more generously, needs to regulate the increasing amount of cars. Disappointing for those of us that chose to live here to escape the crowds, clampers and opportunists, and go back in time a little. The march of progress and discovery is obviously gathering speed! Profiteering is not however widespread in Croatia and I suspect, this year, there is an element of “testing the water”. We’ve read of the odd occurrence of money exchange offices offering rip off rates to tourists but these are isolated and the perpetrators are normally named and shamed in the local press. However it’s always best to change money at a bank or post office. Like anywhere else, the key to a balanced holiday budget is to be armed with some basic information, check out prices beforehand, check your bill, and don’t be afraid to say no to the occasional pushy merchant, accommodation provider or restaurant owner. A large sea bass or sea bream weighs about 0.4 kilos but it’s perfectly acceptable to ask for the weight of your fish before you pick it. The tap water is good almost everywhere – ask for “voda iz spina” (water from the tap) to avoid any confusion and steer clear of excess prices on bottled water. We tend to think we’ve had a good deal on a main course for two, a litre of wine and perhaps a coffee, if we’ve spent less than 200 kunas in total. Still a great deal compared to the western European equivalent! If it’s Saturday, and you can hear the loud honking of the horns of a convoy of cars, there must be a wedding on. 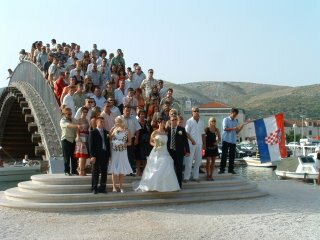 Croatian weddings are an all day affair and hard work for the families of the bride and groom. Not for the Croatian bride and groom, a quiet morning getting ready to look your best for your public debut at the church. No, you have to entertain all the guests before you’ve even got married – bride’s friends at the bride’s parents house and groom’s friends at the groom’s parent’s house. The dangers of being jilted are also minimised as the groom goes round to collect the bride from her house, before the wedding. He’s offered an alternative but usually ends up picking the bride! Then it’s off to the ceremony in convoy, flags waving, a reasonably short wedding ceremony, followed by party time at a local restaurant. The party normally continues into the small hours with a number of courses, dancing in between, and a few ceremonies – bouquet throwing, garter hunting (by a blindfolded groom working hard under the bride’s dress!) and cake bashing. There’s no delicate first slice of the cake, the aim is to demolish it as quickly as possible with a sword! The Dalmatians certainly know how to celebrate a wedding and it’s good to know that Croatia is one place where family traditions are still thriving. Prvič Luka is a charming village on Prvič Island, with a relatively new up-market hotel, Hotel Maestral, which was formerly an old stone schoolhouse. The village has a good range of shops and a small market. The post office is on the main street and the nearby tourist office opens according to demand. Apart from the hotel, there are a couple of restaurants and bars on the front, including a restaurant specialising in sardines cooked in a variety of ways. The hotel restaurant offers Marlin on the grill and freshly caught fish at just a little above mainland prices. Hotel Maestral has a number of interesting tours listed on its website including a visit to the donkey sanctuary on nearby Logorun Island. There are 5 ferries a day connecting Prvić to either Vodice or Šibenik on the mainland and taxi boats can be arranged. Šepurine, on the west coast of Prvič island, is an attractive sleepy town, with some lovely stone houses and an old summer residence of a famous Šibenik family – the Vrančićs - who are alleged to have conceived the idea for the parachute and wrote the first Croatian dictionary. Zlarin island lies just over a mile off the entrance to the canal leading to Šibenik. It is one of the largest islands of the Šibenik archipelago and though there are a few small bays at the bottom of the north east coast, Zlarin is the only settlement on the island. No cars are allowed, Zlarin is the only place in Croatia that crafts coral into jewellery and ornaments, and it is also famous for being the birthplace of Anthony Maglica who invented the Maglite flashlight. Although one of the numerous émigrés to America, to escape the poverty between the two World Wars, Anthony, now in his seventies, continues to help Zlarin with its infrastructural projects. The Post Office is on the sea front, as is the tourist office, and the village has a hotel, supermarket, shops, medical centre, coral museum, art gallery and a few restaurants and bars. The Four Lions hotel and restaurant has a website, http://www.4lionszlarin.com/ and often acts as the base for organised swimming excursions around the nearby islands. Go to http://www.swimtrek.com/ for more information on this novel way of exploring these islands. There are four return ferries a day (two on Sundays) from the beginning of June to the end of September, connecting Zlarin with Vodice and Šibenik. Krapanj is the smallest inhabited island in Croatia and also its lowest lying. The island traditionally thrived on the harvesting of sponges. It’s just a five minute boat trip from Brodarica on the mainland, famed for one of the best fish restaurants in the area - Zlatna Ribica. Hotel Spongiola is a new hotel, built on the site of an old sponge co-operative, and has been fitted out to high standards with an indoor pool, fitness centre, and sauna. It specialises in diving trips but can also offer a range of other water sports and excursions and has a small beach in front of it. Note for Sailors: All the hotels above have laid a visitors' pontoon for passing yachts though, in some cases, these have proved popular with local boat owners! If the pontoons are occupied there are generally spaces in the harbour or along the harbour wall. For those of you that don’t know, a Tisak is a small shop or stand, often a cabin in the middle of the street, which sells newspapers, magazines, cigarettes, etc. It’s a national chain and you won’t have to look very far before you find one. Time Out’s Magazine – A Visitors Guide to Croatia – is distributed in Croatia through the Tisaks, as well as internationally in major cities and airports. However, in the more cosmopolitan centres, you’ll also find a number of other magazines in English as well as English newspapers no more than a couple of days old. Magazines and papers emanating from the UK and America often have hefty price tags but yesterday we found a new, locally produced, magazine called Globus International, claiming to be the “Ultimate Guide to your holidays in Croatia”. The welcome page is written by no less a persona than the Prime Minister Ivo Sanader, and whilst we can’t entirely agree with the claim on the front page, it is an interesting read and comes at the bargain price of 12 kunas. We were told that the August Issue was new so it’s possible there may be further publications throughout the year. Features in the August issue include seven small islands for sale, ten of the most beautiful luxury villas, pets in Croatia, the real estate market, Tito’s treasures and the best restaurants along the coast. It’s a little thin on listings and we therefore wouldn’t recommend it as a substitute for a guide book or Time Out’s magazine. However the feature on the islands for sale is fascinating, with a number of locals “stuck” with small islands they’ve inherited, which are pretty well worthless as the government have banned the building of any houses at all on them. The real estate article is also full of insight as to how the property market is developing in different areas. As you would imagine, the highest prices are in areas where property is at its scarcest, and in many cases, because the local council has yet to release its regional plan to indicate where development may, or may not be allowed. It includes maximum property prices per square metre around the coast and the islands, as well as which nationalities appear to be buying in which locations. According to the article, Dubrovnik and Rovinj are still the most expensive locations with a maximum price tag of up to €6,000 per square metre for a built property. 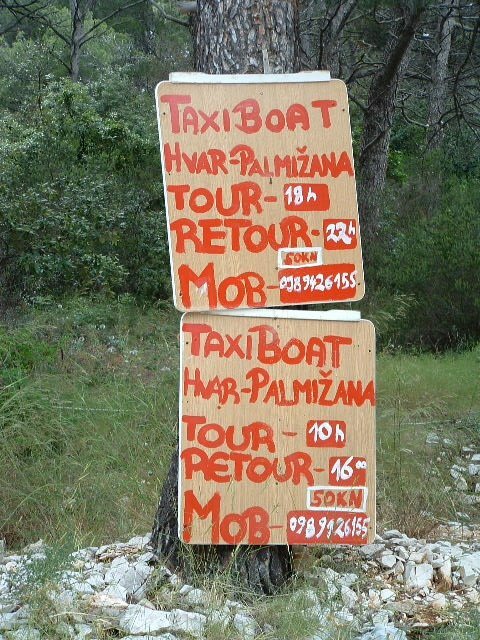 However, whilst it suggests that Dubrovnik prices are stabilising, and Rovinj prices are falling, Hvar seems to be catching up fast at €5,000 per square metre and rising. Lowest prices are in Sibenik (€1,400), and on the island of Vir (€1,500), popular with Hungarians and where the government has recently knocked down a number of properties apparently constructed without planning permission. Prices on Čiovo and Šolta are reported to be stable at €1,700 per square metre. American money seems to be concentrated in Dubrovnik and Hvar, the South Africans seem to have singled out Komiža on Vis island, and Russian and British money seems to be increasingly ubiquitous. If you’re in Split, hungry for something to read, and can’t find what you want in the Tisaks, try the International Bookshop on the Riva which normally has a good collection of English magazines and books. In Trogir, there's the Harry Potter bookshop in the main Cathedral square. If you’re short of something to do on rainy days, see our earlier posting Newspapers, Magazines, TV, Radio and Theatre for more information. Full marks to Croatia Airlines for being one of the few to get their passengers to and from Heathrow after the security alert last Thursday. The Heathrow flight was due to arrive at Split, via Zagreb, at 15:40 and eventually arrived at 12.30 am the following morning. 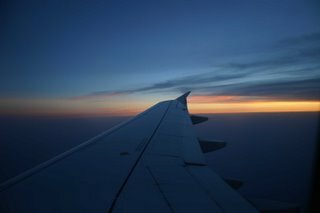 However passengers were exceptionally lucky, given that most other airlines cancelled their flights and the inbound plane did not leave Zagreb, for Heathrow, until the middle of the afternoon. Apparently the information service was good and the connecting plane waited for passengers at Zagreb. Don’t be put off if you have to travel via Zagreb to London (Heathrow), as long as you’re travelling on one of the days when the wait time is less than 2 hours. Before the low cost airlines and British Airways started the Split route, it was a regular occurrence for us, particularly outside the summer season. Zagreb is a cosy airport and, apart from having to queue for the Split boarding card, as you arrive in Zagreb heading to London, (you get both boarding cards going the other way), it’s relatively hassle free with luggage going straight through. It’s for you to decide whether the extra couple of hours journey time, less if Heathrow is closer to you than Gatwick, is worth the saving. Re reading recent postings, readers may imagine that we are on the marketing payroll of Croatia Airlines! That’s not the case and, selfishly, we’d prefer to keep some of this information to ourselves. It’s just that after so many years of having a monopoly on most of the Croatian routes, and having been a little slow to adjust tactics and prices to the opening up of the Croatian skies, Croatia Airlines are now very competitive and have always had high standards of safety and service. They seem to be allowing themselves to be overlooked at the moment, in favour of the more aggressive marketing campaigns of the newcomers to Croatia, and it seems only right to give them credit when it is due. Croatia Online - Croatia In August - Is It For You? On the upside, the Dalmatian Coast is only a two and a half hour flight away from London, and there’s now a wide choice of carriers to choose from. Croatia Airlines still seems to provide the best value at the moment, for short notice bookings - see our earlier posting Croatia Online - Travel Information and Holiday Tips. Why else should you choose Croatia? Although Croatia has been hot and sticky over the last week or so, the heat wave is now passing through and it should be much more pleasant. Most of us have now got used to the fact that global weather is much less predictable than it used to be so there’s not much to choose between the Mediterranean destinations in this respect. There are 1185 islands, islets and reefs in all and, if you choose carefully, you can still find some quiet ones if that’s what you’re looking for. Brac, Hvar and Ciovo, the nearest to Split, are all heaving with tourists at the moment. Search out some of the more isolated islands and their bays and you’re bound to find some holiday accommodation that’s not yet been snapped up - see below. The scenery is breathtaking and still relatively unspoilt. The indented coastline, and the mountains which rise up dramatically behind it, make for an idyllic holiday setting. “Crystal clear” has become a cliché for the Adriatic waters along the Croatian Coast but it’s an apt description. Some places, particularly the islands, are more crystal clear than others. Hotels rooms are in short supply in the restricted high season but apartments are plentiful. It’s a riskier option but, in general the Croatians are honest and straightforward to deal with. Have a look at our posting Croatia Online - Holiday Apartments in Croatia for information on what to expect. There are plenty of commercial websites and agencies to help you choose but if you have the time to search the local tourist boards you’ll probably find a wider selection in the more remote destinations. Pick a destination and then go to the Croatia Tourist Board site (see useful websites below) which will list the websites of the local tourist boards. Some of the websites are more developed than others! The cost of eating out is still much lower than many other Mediterranean destinations and, in most places there’ll be plenty of choices of restaurants. The local offer is generally plain grilled fish and meat but new restaurants are slowly getting more adventurous. 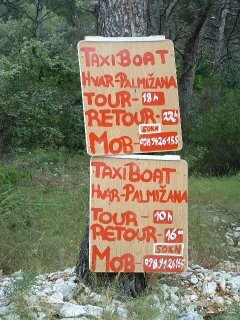 The exceptions are Dubrovnik and Hvar where you can expect to pay a bit more than elsewhere but have a much wider choice. If you’re self catering then meat and fish prices will be about the same as England but alcohol, fruit and vegetables considerably less. The pace is easy, it’s a relatively safe country and the Croatians are a helpful, tolerant and courteous race. You generally won’t get bombarded with super sales techniques or interrogated as to your origins and spending power. Not so much any more but there are still a few places that have yet to catch up with the leading tourist destinations. The small islands around Sibenik are a good example; Pasman and Ugljan islands, near Zadar, are another. If you don’t mind travelling a bit further to your destination, the trick is to pick an island or a mainland destination that’s not too close to the main airport destinations of Split, Rijeka, and Dubrovnik. The Istrian peninsular, in the north, is also a relatively easy destination by road, for the Germans, Italians, Austrians and Eastern Europeans and tends to be jam packed with tourists in July and August. There are plenty of huge old style package hotels around but they don’t tend to suit the modern western European holiday maker. Small family or boutique hotels are in short supply though there are many more planned. It will be interesting to see if these can be fast tracked through Croatia’s bureaucratic and grinding systems for planning permissions and licences. We’ve seen portaloos and little changing rooms spring up from nowhere for the first time this year and the regular cleaning of the beaches takes place before the high season. However the most popular destinations have beaches that are jam packed. Remember that most Croatian beaches are pebbles, not sand, so plastic shoes are essential. Look at Croatia Online - Croatian Beaches for more information on this subject. If you’re planning a sailing holiday you’ll need to get to your evening destination early to be assured of a mooring in July and August, particularly in the hotspots around Hvar and Dubrovnik. In short supply on those fortunately rare rainy days. There’s little in the way of leisure parks - entertainment is generally confined to music and dance in the summer festivals that are held in almost every town or village of any reasonable size. If your children don’t like swimming and the odd banana ride, be prepared for the boredom factor to creep in. You’ll find crowds and traffic at any Mediterranean destination worth going to in July and August. If you do your research properly, you’ll have a better chance of avoiding them in Croatia. However, if you have the choice, you’ll get the best from Croatia in September when most of the tourists have gone and the sea’s still warm. Many of the seasonal bars and restaurants may well be counting their money and have closed by then but, in villages and towns of any size, you’ll still find somewhere. Hopefully the Croatian Tourist Industry will soon learn that it’s in their interests to extend the tourist season outside the traditional months of July and August. See Croatia Online - Which Destination and When? for more information on where and when to go, and what to do. The most recent and up to date guide book on Croatia is published by Time Out who have also produced a Magazine for Visitors to Croatia, on sale at all the major international bookshops, at Croatian "Tisaks" (kiosks), or via its website. Go to http://www.timeout.com/travel/croatia/ for more information. Today's photo is reproduced by courtesy of Time Out Publications and features on the front cover of its guide. Readers please note that we have today, 4th July 2009, published an update to this posting which you can find by clicking here. Photo: You wouldn't know unless you'd been there! We’ll continue to submit specific tips as we find new places of note and, of course, Croatia Online will continue to provide plenty of up to date news, views and information on this site, to keep readers in touch with what’s really going on in Croatia – destinations, lifestyle, culture, business, travel, sport and politics. Link to Croatia Online - Index to Postings for a full list of subjects, with direct links to them, or scroll down this page and browse through.